Welcome to Garden Bloggers' Bloom Day for December 2016. Here in my USDA Hardiness Zone 6a garden in central Indiana, any thoughts I had that Fall would really last forever have been blown away by the cold chills and snow of Winter. I was grateful we were spared the big snowfall that fell north of us this past weekend, but that "sparing" didn't last long as we got a decent pile of snow dumped on us a few days ago. I measured about the three inches of the white stuff. The picture to the right was taken at day break just as the snow started to fall. By mid-day, we were covered. But on to the blooms. As you will see, I took these pictures the day before it snowed. One plant that needs no snow cover is the hardy Christmas Rose, Helleborus niger. I've been checking the buds on the variety 'Josef Lemper' and expect on the next sunny day, those buds will open. Next to it is another variety 'Cinnamon Snow'. This is not a great picture, but trust me that the buds on 'Cinnamon Snow' are smaller and tinged with pink. There were several seedlings under 'Josef Lemper' this summer, so I transplanted some of them out to grow on. Looks like I have a few years to wait for this one to bloom. Nearby, the last of the autumn crocuses appear to be caught in the act by the cold. It's buried in snow now. I want to plant more autumn crocuses and will do so next fall. Remind me! Elsewhere in the garden the last of the violas are also shivering in the cold. I always let them go to seed in hopes they will just show up here and there in the garden, and they often do. Since it is so cold outside, and now snowy, I have to get my gardening fix indoors. Looks like its blooms will be featured in a January bloom day post, along with the blooms of Lily of the Valley and hyacinths, which are the other flowers I force into bloom indoors each winter. Until they bloom, I will continue to enjoy the blooms of the euphorbia commonly called Crown of Thorns. The two I have, one pink, one yellow, are always in bloom, every day of the year. What's blooming in your garden on this cold December day? We would love to have you join in for Garden Bloggers' Bloom Day and show us. It's easy to participate. Just post on your blog about what's blooming in your garden on or about the 15th of the month. Then come here and leave a comment to tell us what blooms you've got to show us and put a link in the Mr. Linky widget to make it easier for us to find you. The winter temperatures are hitting here as well on Long Island with highs in the 20's for the next few days. It is great seeing your winter hellebores getting ready to open. I had planted some myself a couple of years ago and it is nice seeing those buds. Thanks for hosting. Even at this time of year, it is fun to go out into the garden and look for its inner beauty. Happy GGBD Carol! Hi, I hope I connected my site correctly! I wasn't sure the widget worked with my bad Internet. http://www.courtneyhelena.com/home/garden-bloggers-bloom-day-december-2016 Anyway, it's a bright, sunny, warm spring morning here in southern Brazil, and the garden is bursting into bloom everywhere I look! It was hard to choose the images for this post, because there are so many beautiful blooms everywhere I look. Thanks so much for hosting this super-fun event... this is my first GGBD! I had one hellebore with buds - who knows if it will even bloom now. Today and tomorrow are going to be nasty. Happy to see your indoor activity. I am an expert in not being able to rebloom amaryllis. Thank heavens for GBBD! Thanks for hosting this blog hop. Have a great holiday season. Happy cold GBBD Carol and thanks for hosting, even in the snow! Blooms are especially precious this time of year. Thanks also for reminding me about lily of the valley in January. I hope to force a few myself this year as yours always look so nice. Hope you and your garden fairies have a great holiday season and a happy new year! There's no snow here and there's been precious little rain but a storm is headed in our direction. I'm very happy at the prospect of the garden getting a good soak. Thanks for hosting GBBD and Merry Christmas! I too got out and took my photos before the snow fell, it's so much easier (and warmer) that way. Happy Holidays to you! I enjoy seeing the Hellebore! I won't see mine until about March. Blooms are pretty sparse here due to recent snow and ice — which though lovely, takes it toll garden-wise. So not too many photos on offer with this, my first participation in Garden Bloggers Bloom Day as eGardenGo. Hello Carol! Happy Bloom Day to you! My blooms are in short supply here, though I have a few seedpods poking up through the snow. I'll take whatever I can get! Brr! 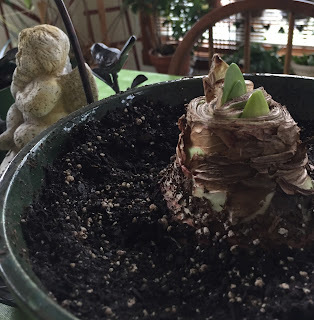 My Amaryllis has two big buds, but they have not opened, yet. I brought my Gerbera Daisy in before the first frost. It had 3 buds, and they blooming, now. I just noticed that there is another bud. this is the second year for overwintering this plant. Hi Carol, usually I can find some outside flower to take solace in, even for December, but today there was nothing. Fortunately the greenhouse saves the day! I have one hellebore blooming..it started in November. I could plan my whole garden around hellebores, but, I don't. Or, at least, not yet. Happy GBBD. My peonies were tiny infants when they handed them over to my arms. They just Deliver Flowers after a long trip in the same day. Then after traveling in NY public transportation, the high temperature forced all flowers to open. The matured blossoms still moved my heart. How fantastic to have a flower that is always in bloom! I have some gazenias in the garden that are always blooming. Blooms are in short supply, but it's nice that there are some still! I need to look at planting hellebores for next year. So glad to see your hellebored have buds :) I grew only H. x orientalis in my previous garden (Missouri); now I wish I had gone ahead and tried H. niger...! Just found your link party. I love gardens and flowers. Thanks for hosting. Merry Christmas! Nothing blooming here! But my amaryllis may make an appearance soon, does that count? kadupul flowers is a must have flower for a dream garden. We have several of those night blooming fragrant flowers in our garden.